Noel Counihan (1913 – 1986) was one of Australia’s important artists, a social realist, political commentator, and a man with a deep understanding of social hardship in his time. His life is well documented, and the story of his address to the crowds from within a locked cage whilst the police had to cut him out is well known. I only want to talk about his artistic achievement with regard to The Cough… Stone Dust, (1947 © Estate of Noel Counihan). He illustrated the ordinary people, the workers, the downtrodden and unemployed in Australian society in the 1940s and 1950s, and no image is more heart searing than this lino-cut which depicts a miner with silicosis (pneumoconiosis) exhausted from coughing. This picture is used as the logo of The Silicosis Project, a major inter-disciplinary European research project in its struggle against silicosis http://www.sciencespo.fr/silicosis/ . It is a new research project combining history, medicine, and social sciences. This project deals with one of the deadliest occupational diseases in history; silicosis, caused by inhalation of crystalline silica dust particles. The occupational disease is mainly due to mining in silica bearing rock, but also associated with other dusty occupations such as pottery. I was brought up through the 1950s and 1960s on a copper mine in Zambia where silicosis was an important part of the average underground worker’s life. Regular X-rays and medical examinations by the Pneumoconiosis Board theoretically meant that a worker could lose his job if the disease was discovered. Looking back, with hindsight, it is obvious that the board was used to keep workers working as long as possible despite development of the disease. Compensation at the time was a pittance, and this was particularly true for black workers. I have been moved by Counihan’s linocut which shows a miner wracked with cough, exactly as I saw men in our small town suffering, trying to catch their breath with the inflammatory, fibrotic lung disease. The Counihan Estate has kindly granted permission to use the outline of this image in my work. I have subtracted all but the outlines from the original image and superimposed a formalised bourgeoise pattern typically seen in carpets of the middle classes in the 1940s and 1950s in order to draw a distinct contrast with the jagged outline of the working class miner depicted in cyanotic blue. I have further drawn roughly into the image to emphasise this. 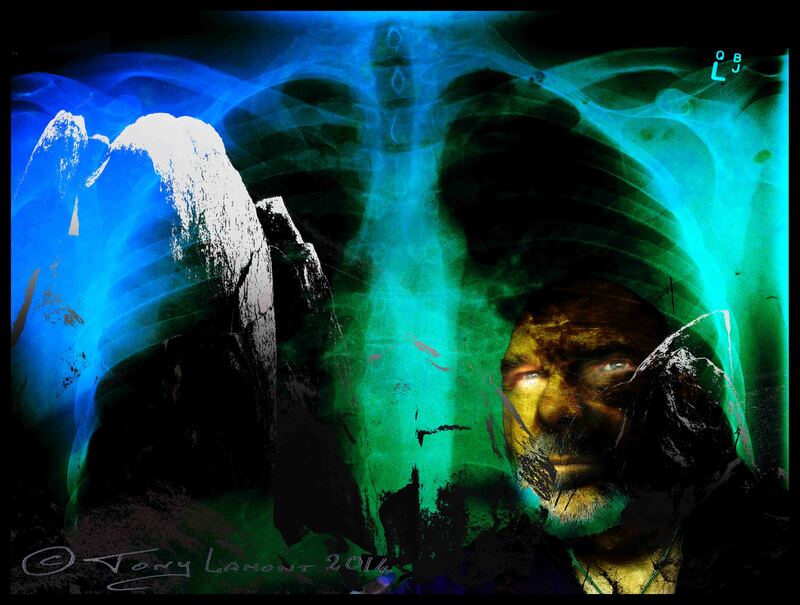 The Chest X-ray of a miner with pneumoconiosis is superimposed on the chest focussing on the lungs to provide the only bright colour in the image. This picture will be published on my blog. I shall keep a copy for myself, but the picture is not for sale. Sorting through forgotten back files I came across this, I can only just remember doing it but since there were no notes at the time, my thoughts when I made it remain a mystery. Perhaps, looking at the general stygian appearance of the picture, that is as it should be. My lovely wife, ever disrespectful, (and that, perhaps is also as it should be) said that I’ve given myself a tall hairstyle that looks like Marge Simpson – I like to think it looks more like Elvis, but there you are all is in the eye of the beholder. The mountainous shapes in the foreground are taken from large granite boulders on the rocky shore of Magnetic Island; the picture was cut back and drawn out to resemble a Japanese wood-block print. The face in the portrait is rather blackened like a coal miner. Both my family, and my wife’s, come from mining stock originally; copper-mining and coal-mining respectively. Derbyshire coal-mines were often small, cramped, and dangerous. Many miners were tattooed by falling lumps of coal that cut and marked their face, hands and shoulders. I was fortunate never to have to go down the pit to work, though I visited my father underground in the copper mine in Zambia on more than one occasion. The copper mines were much larger airy places, but just as dangerous and from time to time falling rocks would kill miners, and a mud-rush in 1970 killed 89 miners. The chest X-ray in the background was from a miner with early pneumoconiosis – a disease that was rife amongst people who were forced to spend many years below ground in unsafe conditions breathing silicon-laden air causing fibrosis of the lungs leading to emphysema. Of course smoking was common at that time, and the combination with fibrotic lungs contributed to a high rate of lung cancer in that group of the population. I have called it Vision because the face with red eyes emerging from the darkness, into the light appears to be seeing life anew – perhaps seeing into the future.